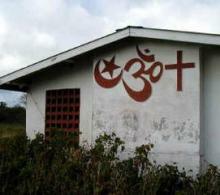 This all-purpose house of worship is from western Trinidad. At first a Spanish colony, (named for the “Trinity”), its Afro-Caribbeans tend to be Catholic charismatic or Protestant, its South Asians, Hindu or Muslim. ♦ First was the need to meld the diverse population into a functioning state and not to continue separating children along religious lines (which, in Trinidad and Tobago, also tend to follow ethnic ones). ♦ Third, the government realised that the new nation needed more varied skills than the denominational schools could impart. These had concentrated on educating a small elite primarily through courses in the arts. By contrast, the government promised to provide secondary education of some type for every child who would benefit. To this end it introduced “Central Schools” which included courses in the agricultural, technical and commercial fields. The Denominational Boards, both then and since, have shown no interest in doing likewise. Yet they feared that the government would do it for them by taking over some of their secondary schools in order to offer a more practical curriculum. Articles 1 and 7 serve to prevent this. Thus even today the “prestige schools” which focus on an academic curriculum are mainly denominational. In the light of this situation, Prof. Spence ends his commentary with a beautifully-phrased proposal. 5. John Spence [Professor Emeritus and former Senator of Trinidad and Tobago], “The Concordat on Education”, Trinidad and Tobago Express, 6 April 2006. 10. UNESCO IBE [International Bureau of Education], World Data on Education, 6th edition - Trinidad and Tobago, August 2006. The [Education Act of 1966] Act enshrines compulsory, free education for all children aged 6-12 in public schools. [...] The reality is that free schooling continues for most of the secondary school population, until age 15. It is only because of a shortfall of secondary school places (for about 25%-30% of the cohort) that compulsory, formal, free education comes to an end for some students at age 12. Even so, many in this group are accommodated until age 15 in post-primary classes. Free education means that students do not pay tuition fees but they do pay for books, school uniforms, and transport. 12. Spence, 20 March 2006.